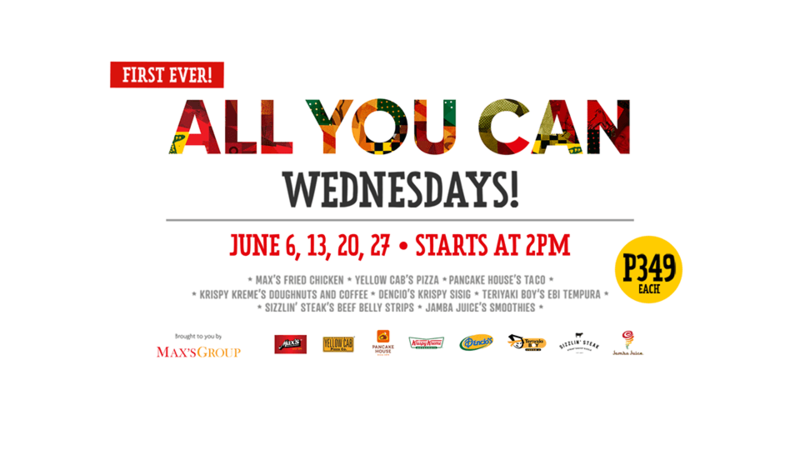 Home > Restaurants > Eat All You Can Wednesdays: Yellow Cab, Krispy Kreme, Max’s, Pancake House and More! The Max’s Group recently launched All-You-Can Wednesdays, and 8 restaurants (Max’s Restaurant, Pancake House, Yellow Cab, Krispy Kreme, Jamba Juice, Dencio’s, Teriyaki Boy and Sizzlin’ Steak) under its casual dining group. Every Wednesday for the month of June(6, 13, 20 and 27). Enjoy unlimited treats from each participating restaurant, all for P349 each. The All-You-Can clock lasts for two hours, and diners will be provided stickers for identification. The All-You-Can offers are available from 2 pm to closing for most of the restaurants, while Yellow Cab’s All-You-Can pizza offer will begin at 12 mn in its 24-hour stores, and for the duration of its opening hours in other stores. 2. Customers will be provided stickers for identification. 3. Strictly no sharing and no leftovers. 4. Refills will be done only when the prior serving has been fully consumed. Refills will be done single serve. 5. Not valid in conjunction with any other promo or discount. 6. In the purchase of goods with promotional discount, the Senior Citizen or PWD may choose to avail either the promotional discount or the 20% discount provided under the expanded Senior Citizens Act of 2010, whichever is higher. 7. Price is inclusive of VAT. Senior Citizens and Persons with Disability may claim VAT exemption upon presentation of valid IDs. Love this blog? Share it now! Which restaurants do you intend to go to and in what order? Just Teriyaki Boy for me.